I have to make a special post for this particular onsen spot in Maniwa city out of the few I’ve visited in Okayama because this beautiful natural hot spring spot is hidden between the mountains giving it a transcendental atmosphere, allowing everyone who enters this town to be whisked away into another dimension, but in this case the dimension of eternal hot springs. If it’s outdoor onsen, you can count me in anytime. We arrived in this small town which was slightly out of the main city (Maniwa) around sunset after a long drive through narrow roads leading up here and it was colder than usual compared to our last location (at Kurashiki), kinda expected because we are at the mountainside area and the drop of temperature allows the arrival of autumn to sweep through the entire valley quicker than other areas in Okayama giving this stunning autumn foliage view. 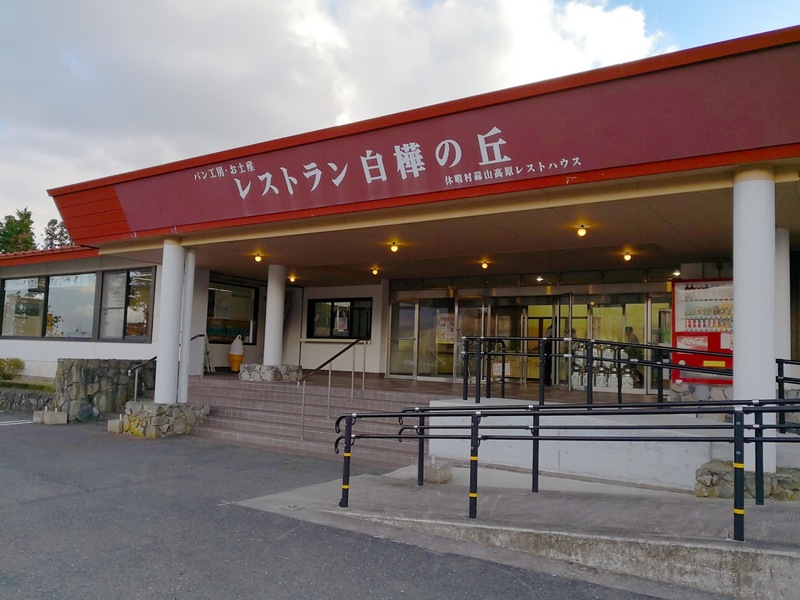 But before I get into further details, here is a brief explanation of Maniwa city where this onsen is located! 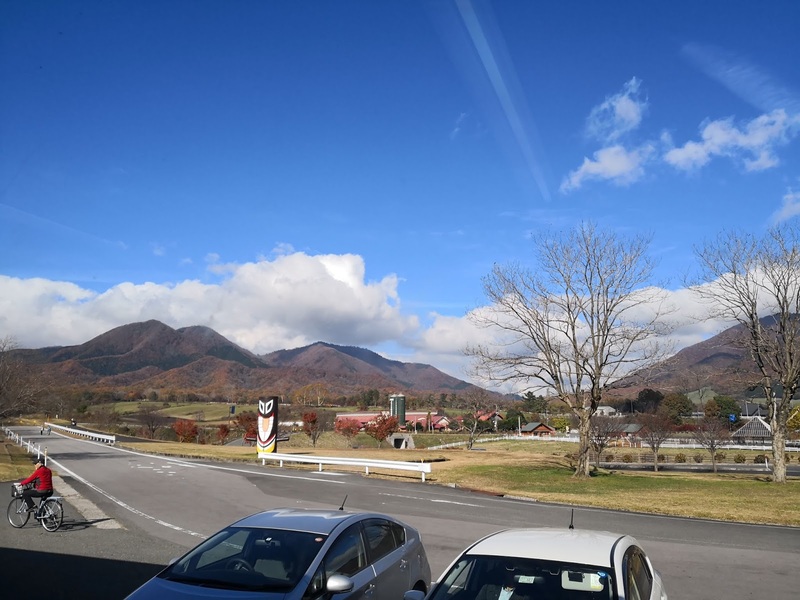 Maniwa city is surrounded by mountains like Mt.Mihirayama, Mt. Asanabewashigen, Mt. Hitsugasen, Mt. Hoshiyama, Mt. Minagasen, Mt Hotokegasen, Mt Tsugurosen, Mt, Amagoisen just to name a few out of the many peaks that attracts annual climbers. 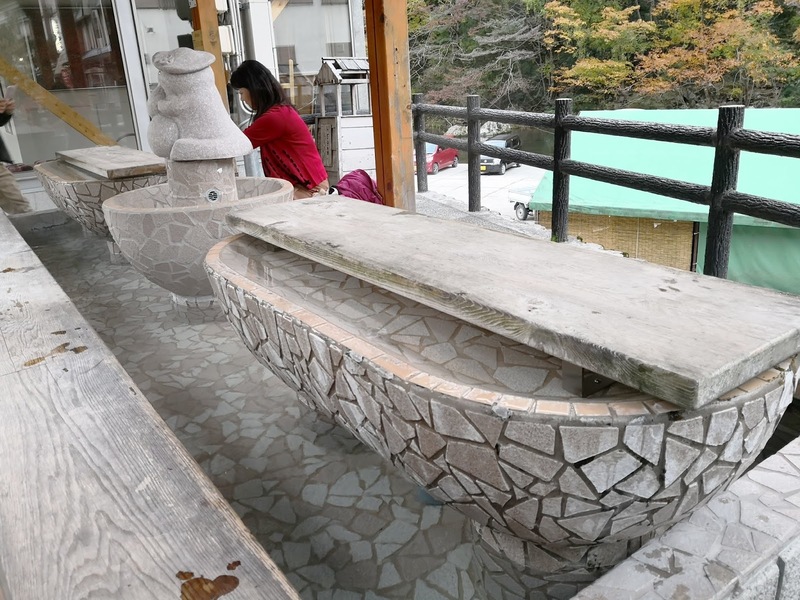 This city offers a lot of outdoor related activities especially mountain climbing/ trekking & skiing (during winter) but little do many know that it also has one of the best natural hot springs flowing through the valley like Yubara. Even those who have visited Okayama before would probably miss this spot as it isn’t as centralized as most tourist attractions (need a car to reach), because of that the natural beauty of this hot spring is well preserved and mostly visited by onsen lovers far & wide who seek high & low for only the best (like me *perasan lol*). So if you are like me who likes nature scenery minus the muscle effort and more into relaxation then please do read on, be sure to bookmark this page too! 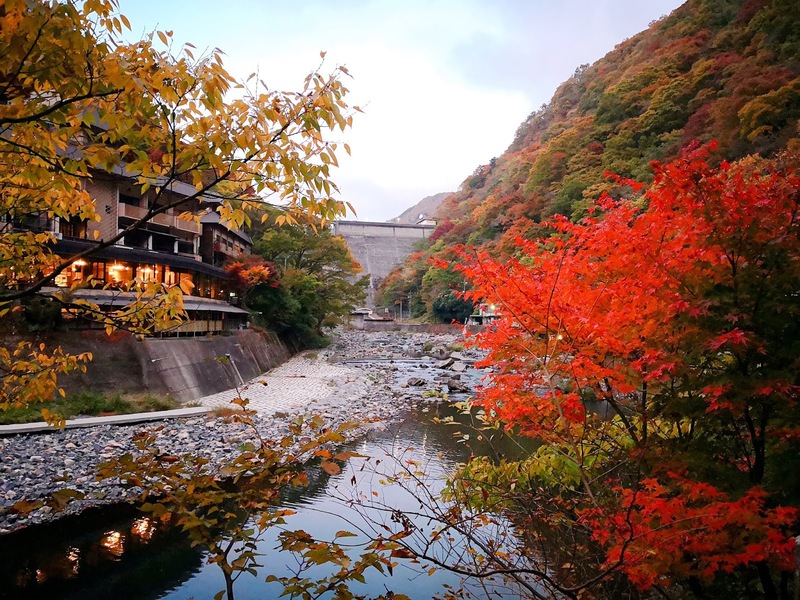 I would sound super bias when i say that Okayama is indeed best visited during Autumn because you guys know how much I love this season compared to others lol but I’m gonna let the photos I’ve taken to speak for itself! 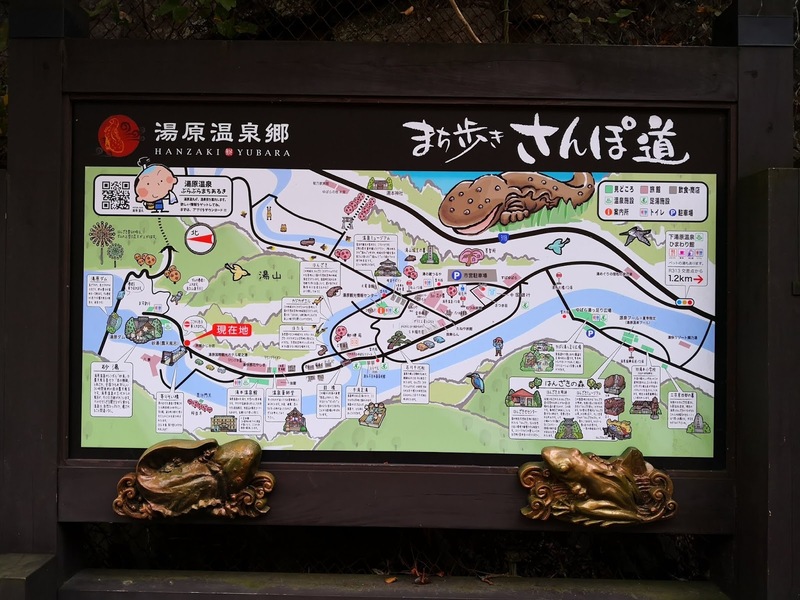 But before I jump into the onsen’s details, let me share some of the things we did during the day and who knows you might find this route interesting to try out too! 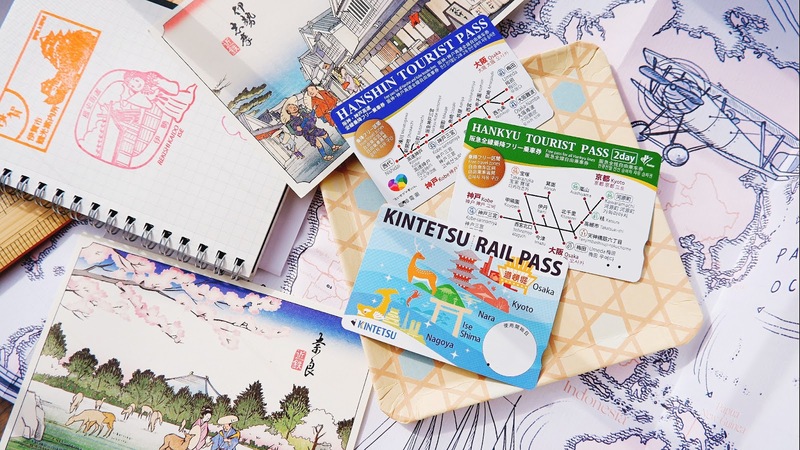 When it comes to traveling I’m mostly go with the flow kinda of person, some people can plan their trip to meticulously (I tried but failed in this area lol) with a strict time schedule as well. IF you are here on a relaxing holiday mission then this would fit in just nicely, you’ll get to cover a few scenic areas without wearing yourself out at the end of the day. 2 day 1 Night route brought us pass Hiruzen Kogen, Kimendai Observation Deck before spending the night at Yubara Onsen. We started our journey around 10am from Kurashiki city and the drive up to Maniwa took us more or less 2 hours, like us driving from KL to Malacca and there isn’t much traffic around the country side area making it such a smooth and relaxing scenic drive (I nodded off a few times because I hardly got any sleep having to pump milk in the middle of the night lols #momduties). 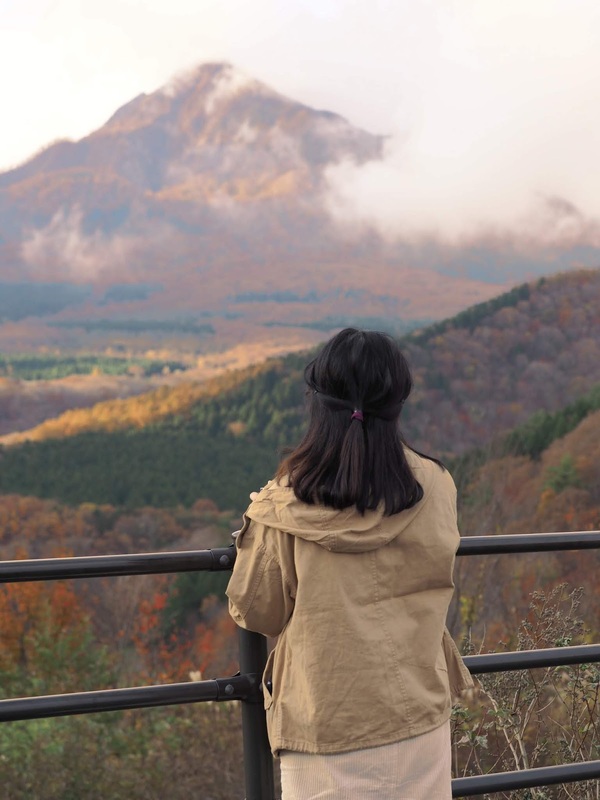 First stop upon arriving in Maniwa city is Hiruzen Kogen, there is actually a nice mini theme park called Hiruzen Kogen Center Joyful park where you can go for rides, shop for souvenirs or just enjoy the view and fresh air. A great place for families with children as it keeps everyone occupied with family friendly activities, I didn’t manage to pass by here as it wasn’t part of my itinerary but based on google pictures it looks so fun! Might plan another trip to come here with lil penguin next time. 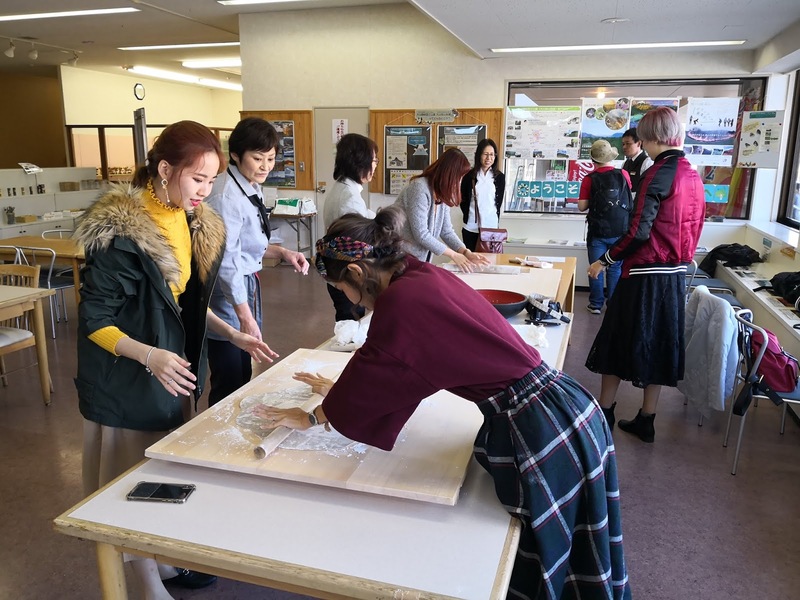 There are many other things to do here like participate in local interactive activities like making hiruzoba (using buckwheat grown in Hiruzen) and fresh ice cream out of fresh milk from local Jersey cows of Hiruzen. 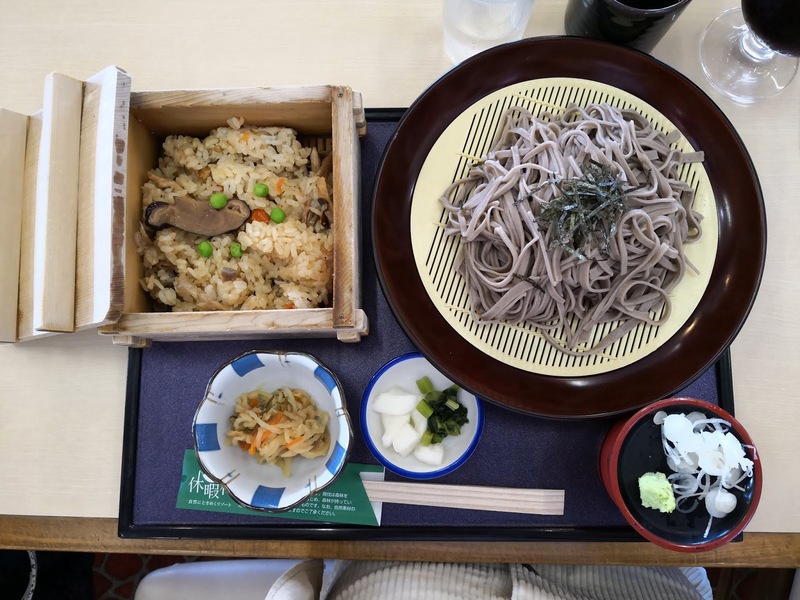 We did our session at Shirakaba no Oka (click here), you may contact them to make a booking if you are interested to try them out. 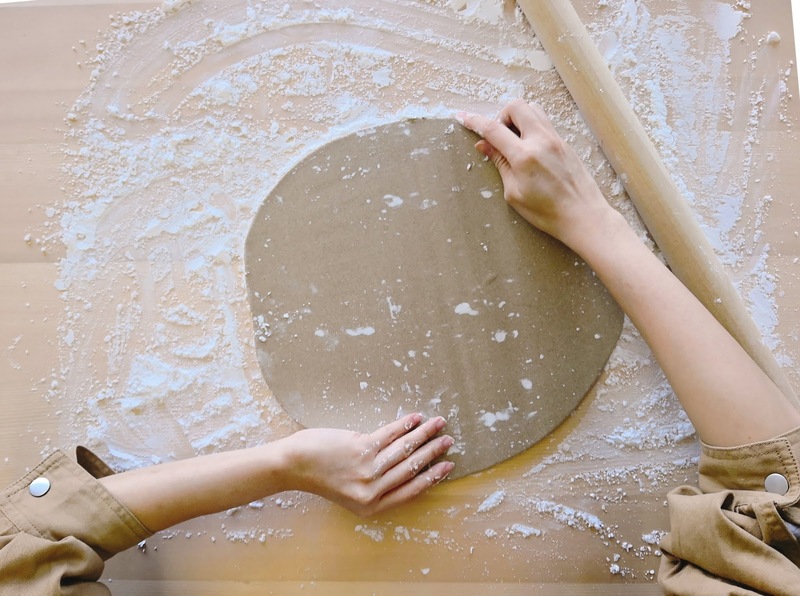 Even rolling the dough has a method to evenly distribute it! 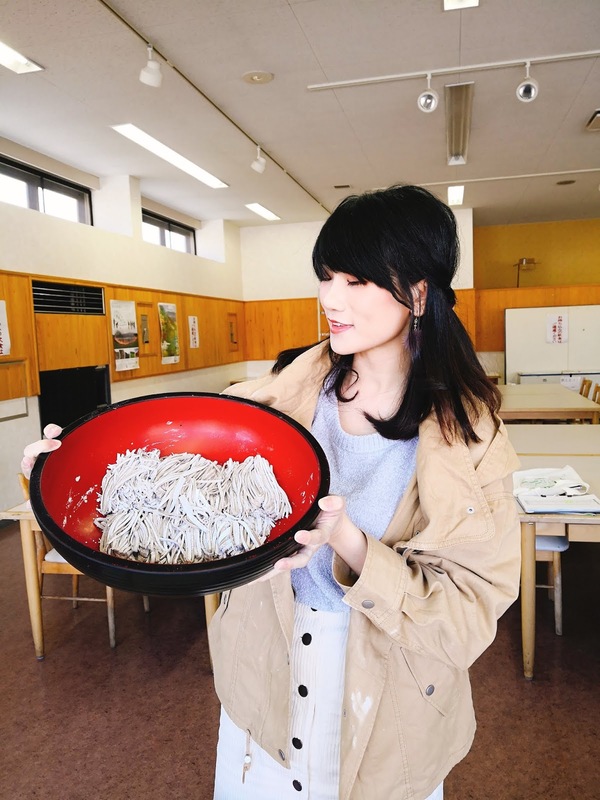 Really fun even for adults like us, after we made our hiruzoba we got to eat it for our lunch and our ice cream for dessert. 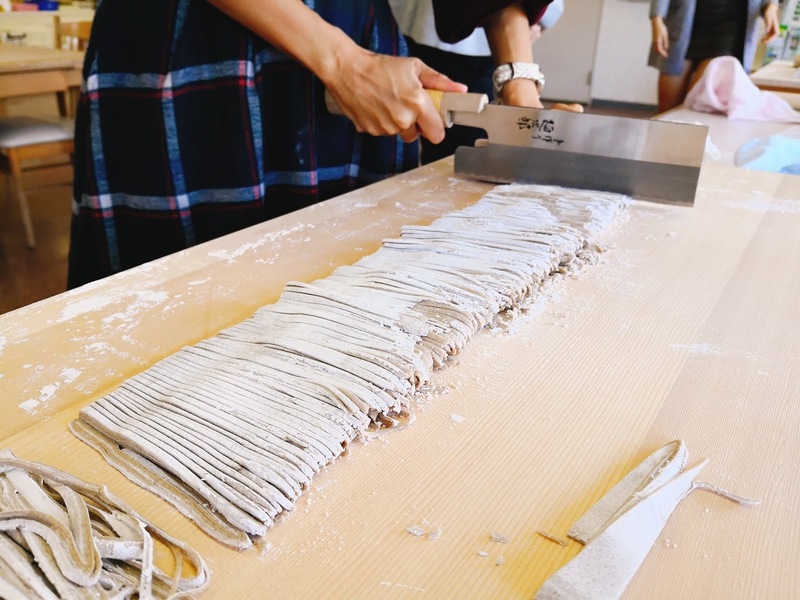 Making them from a scratch is no joke and lots of hard work, I have new found appreciation towards all kinds of foods in Japan because they still make them traditionally and it isn’t easy, lots of labour work! Ingredients are actually very simple but to create them isn’t, so if your kids like to waste food this activity would make them super tired and learn how appreciate their food haha, I’m such a cruel mom. Cheesie slicing like a pro! 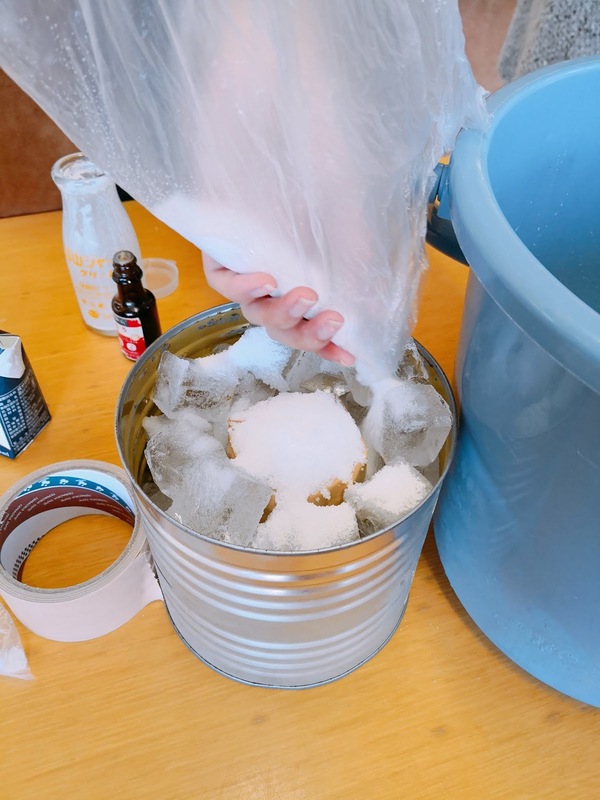 Us trying to evenly roll out our soba dough and slicing it at 1mm thickness care really make your arms & eyes pokaii*(break) and not to mention rolling our tiny milk barrel back & forth for 20 mins just to make fresh ice cream lol. So tiring to make but easily gone within seconds! Tons of salt added in to the ice to lower its freezing point. Remember this fact back in science class? #Trivia: Did you guys know that Hiruzen Kogen Highland is actually the home to Jersey cows in Japan and it’s the largest breeding zone too! Our teamwork fresh vanilla ice cream!! Move over Haagen Dazs haha, #Okayamalenglui squad is taking over the ice cream scene. 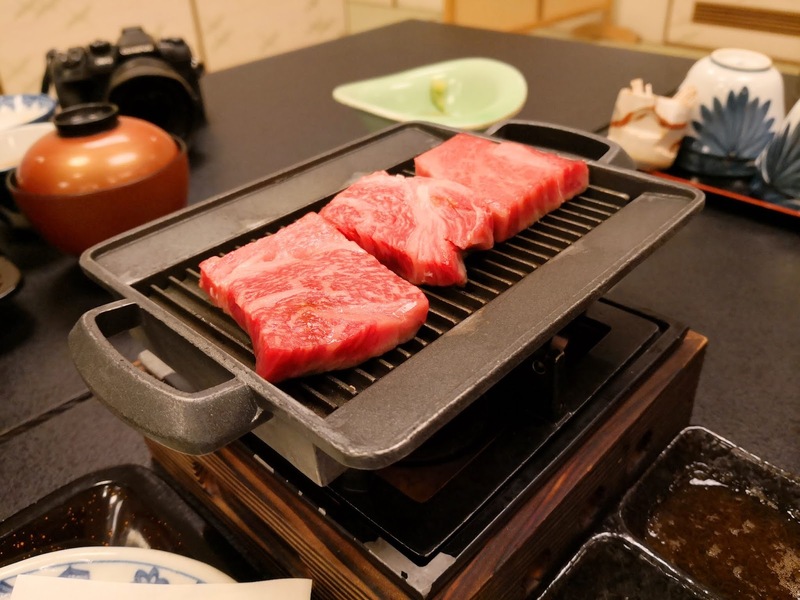 That’s why in this area fresh steaks and rich dairy products are easily available, and they are popular for their yogurt and soft serve ice creams which you can get from almost every shop around the area. 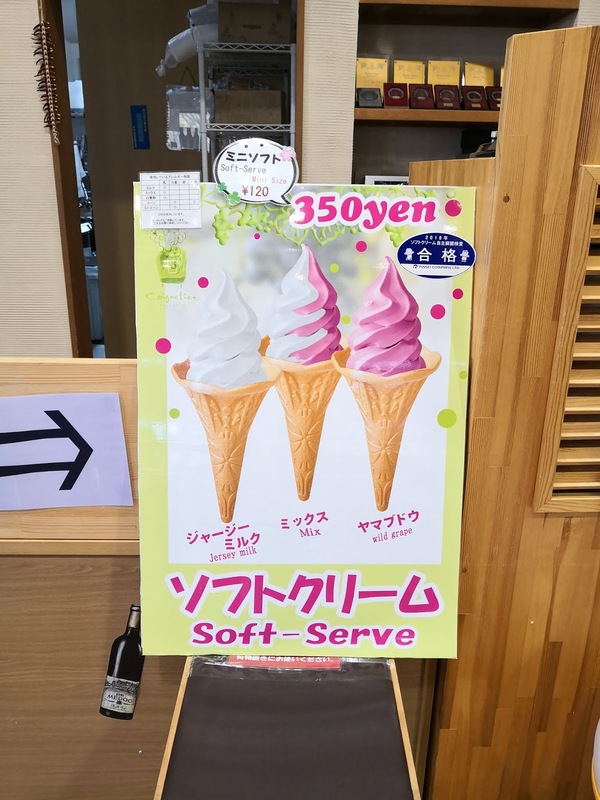 Though I’m slightly lactose intolerant the freshness of the milk somehow didn’t give me a tummy ache problem (was actually expecting it) and even if it did, it would be so worth the laosai episode for such yummy soft serve haha. 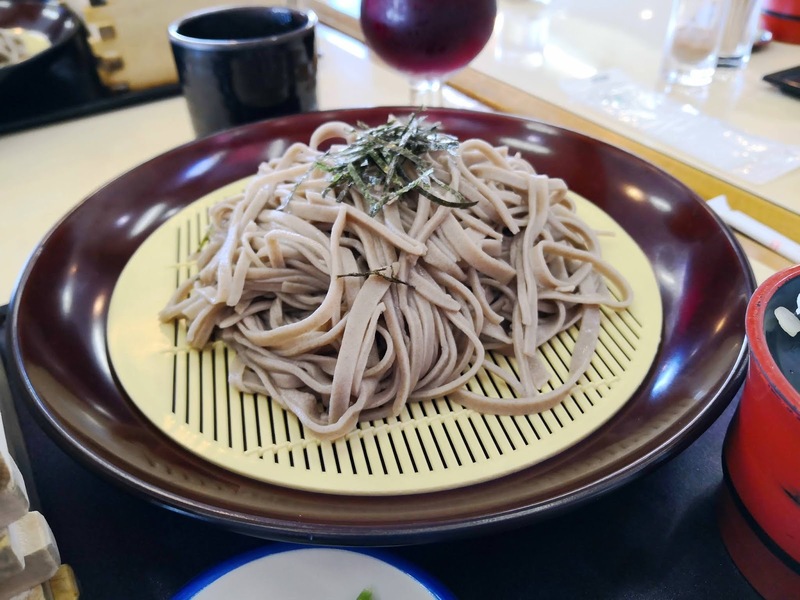 The soba noodles are super uneven from our slicing but still tastes delicious lol. 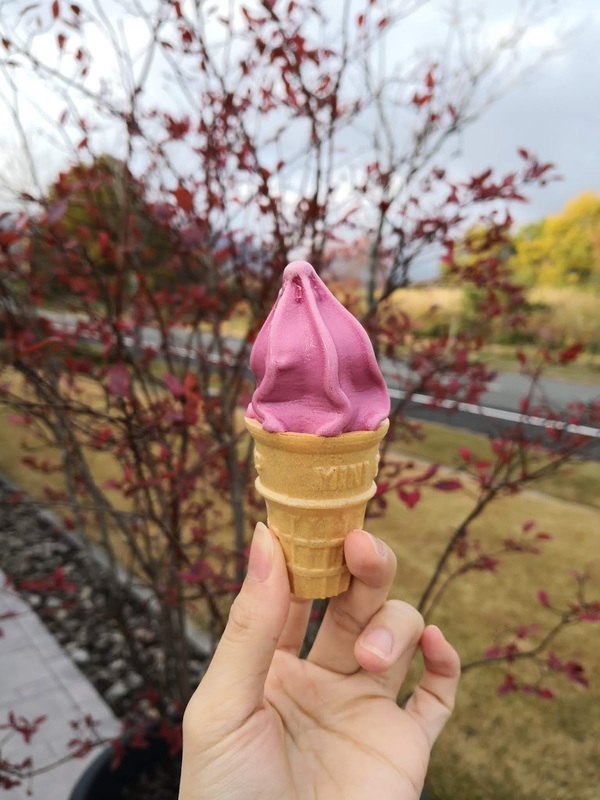 Not far from Shirakaba no Oka is Hiruzen Winery (like 5 mins drive), a location more for the adults lol as their soft serve ice cream even contains alcohol. Very yummy though! 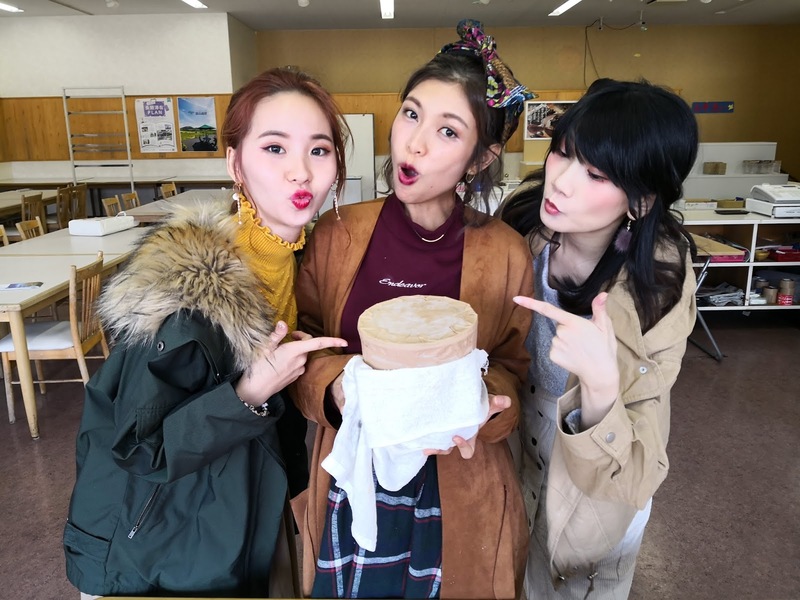 You can test all sorts of award winning Hiruzen wines (Best in Japan) here, yes you read right unlimited tasting session which is heaven for all wine lovers! I used to enjoy drinking casually especially wines but have stopped for almost 2 years because of 2 pregnancies, so glad I get to drink it now (yay). Usually wines has a distinctive bitter taste (sorry I don’t know how to describe my alcohols well so please don’t bash me, ain’t pro just casual drinker) but hiruzen’s wine is actually SWEET! You can buy and bring them back! There are so many kinds of variety and each of them tastes special to me because out of all the wines I’ve drank in Malaysia, never once they had any amount of sweetness in it and for Hiruzen’s it almost resembles normal juice to me lol, can drink until finish the whole bottle in one sitting. Must try their wain soft serves! 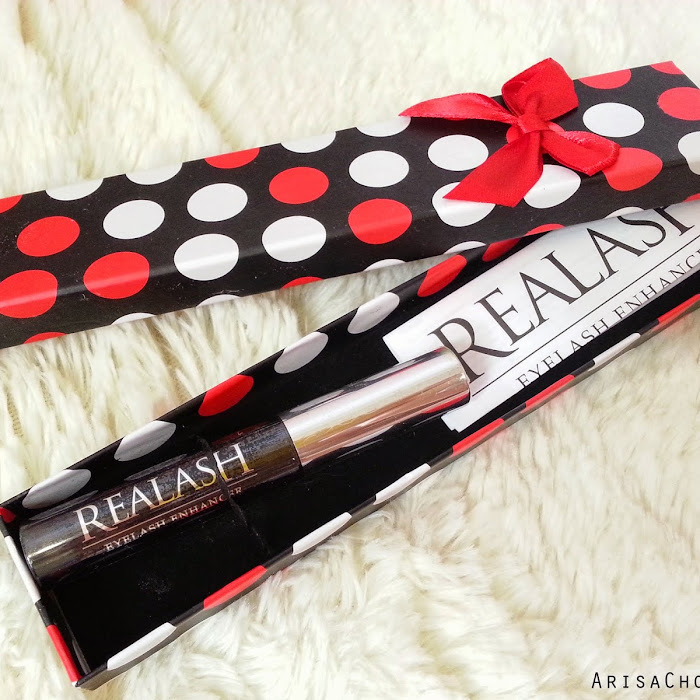 This is the mini version, 120yen only. Best place to go to for a beautiful 360 degrees view of the surrounding mountain landscape that make up Maniwa’s crowning glory and during autumn it’s coated in various shades of browns, oranges, yellows and reds that words alone can’t do its beauty any justice. This R&R stop is a popular spot for people to pass by and stop for a picture (food & toilet breaks) before moving on to their next destination. You can even find cyclist along this route, do make sure to bring a jacket along as it can get rather cold, the observation deck is on an altitude of 591 meters! From any angle on this deck you’ll be able to get beautiful shots with mountains as your background, if you have more time to spare here; the photography possibilities are endless. Now finally the place you all have been waiting for haha, save the best for the last. Always. 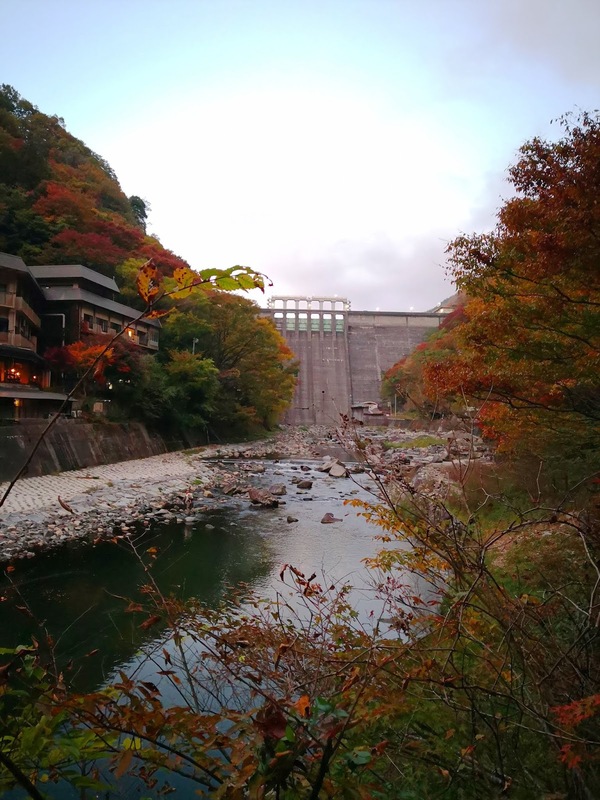 Yubara onsen is surprisingly near from Kimendai Observation Deck, takes a 35min+ drive and by the time we arrived here the sun was setting for the day (during autumn & winter days are shorter). 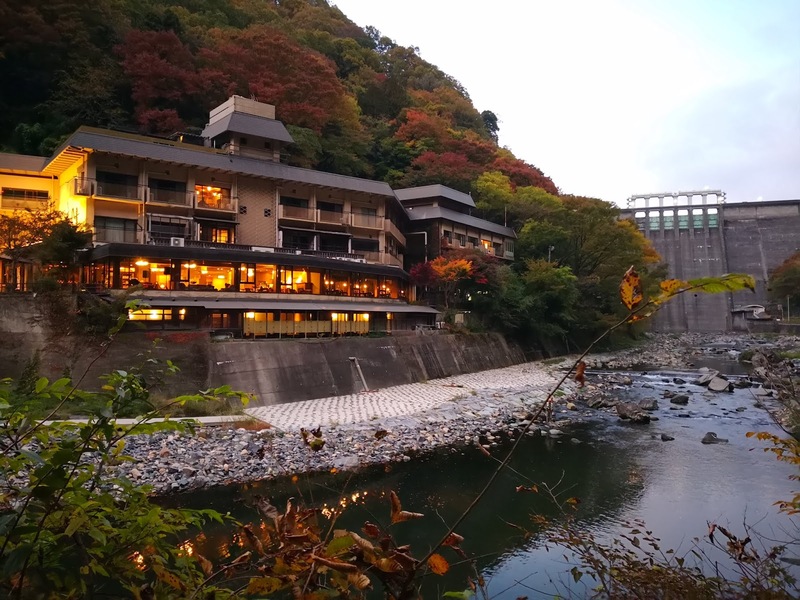 In this area there is an outdoor unisex public onsen called Sunayu, located next to Asahi river and with the dam as a backdrop. 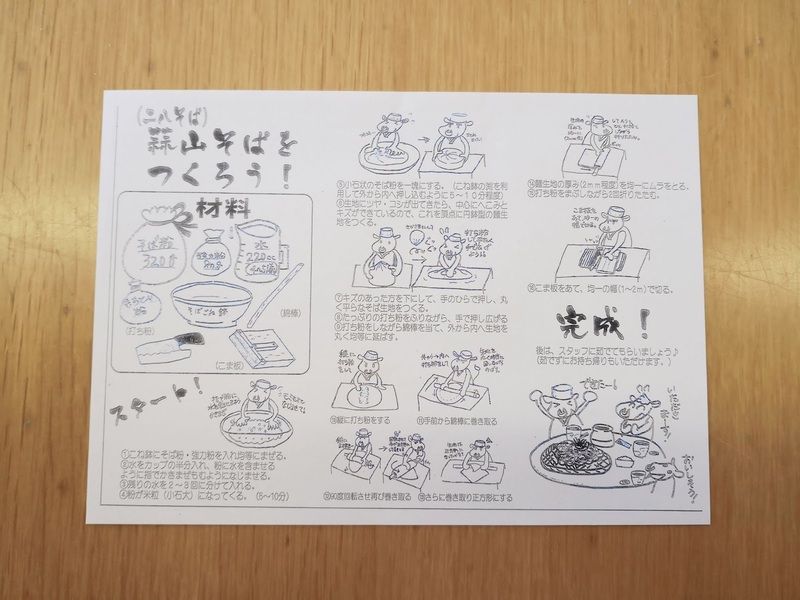 It’s a free and open around the clock (24hrs) for all to use, for men they often go in only with a towel to cover their private parts as for women they can wear a simple bathrobe which can be rented from the nearby Ryokan like Yubara International Tourist Hotel Kikunoyu for 500 yen. During winter this whole space will be coated with snow, such a magical sight which I do hope to be able to see one day (on my wishlist), for now getting to enjoy the autumn view is good enough for me and I’m thankful for that! We actually woke up very early like 6am just to go for a dip at Sunayu, crazy cold as we were only wearing a very light bathrobe (yukata) in 12 degrees lol. It’s actually not recommended to take photos here as there are some people who are not fully covered (ahem) but if you head out early enough when there is no one or a few people then you can take some nice shots! Just make sure to not get anyone in the background ya, wouldn’t want to see butts in your travel photos too lol. This place would be great for those who can’t stand the usual indoor onsen when everyone is 100% naked haha, I understand this very well because back in Malaysia it’s really an unusual culture to see other adults except children in nothing but their birthday suit. It took me awhile to get comfortable seeing other random adults fully naked in public onsen but when you think of it everyone is just there to bath and soak, no one is gonna bother about how you look as well. Unless you are going in with friends, and you’ll have to see them naked haha! Trust me, once this awkward barrier is broken you have unlocked a new friendship level liao. 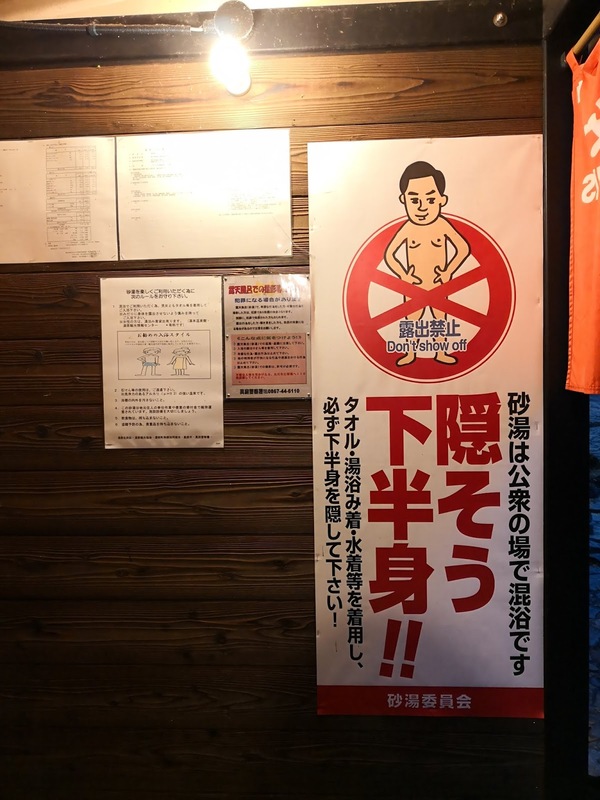 In Sunayu there is even a large sign before entering the area telling people to be decent and not be a “flasher” because no one wants to see your bits haha! Early morning is definitely the best because there is lesser people, so you’ll get to enjoy the tranquillity along with a beautiful sunrise and forest scenery. 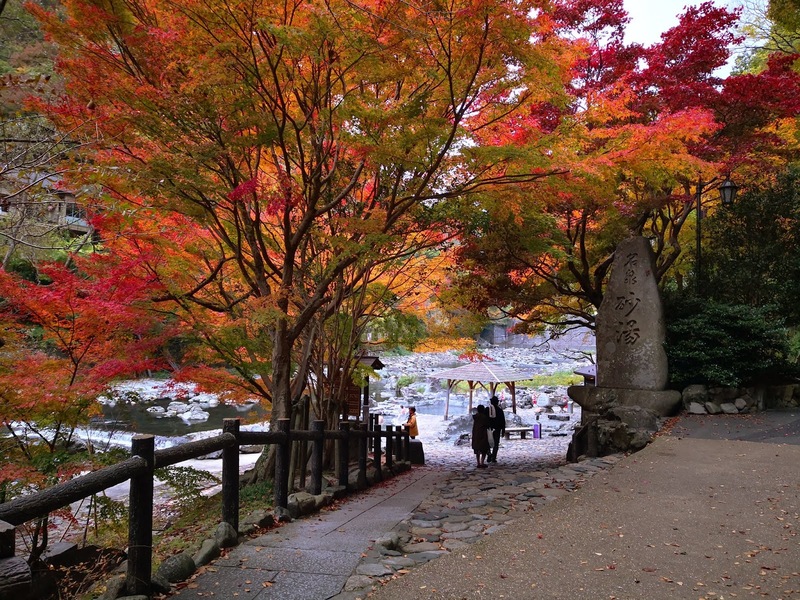 It’s worth enduring the autumn coldness during the short walk from our ryokan to the onsen spot. The hot soak and crisp cool air makes a very good relaxing combination, won’t get too dizzy too fast as well. Managed to get a shot without anyone in it, so lucky! Also my patience paid off haha. 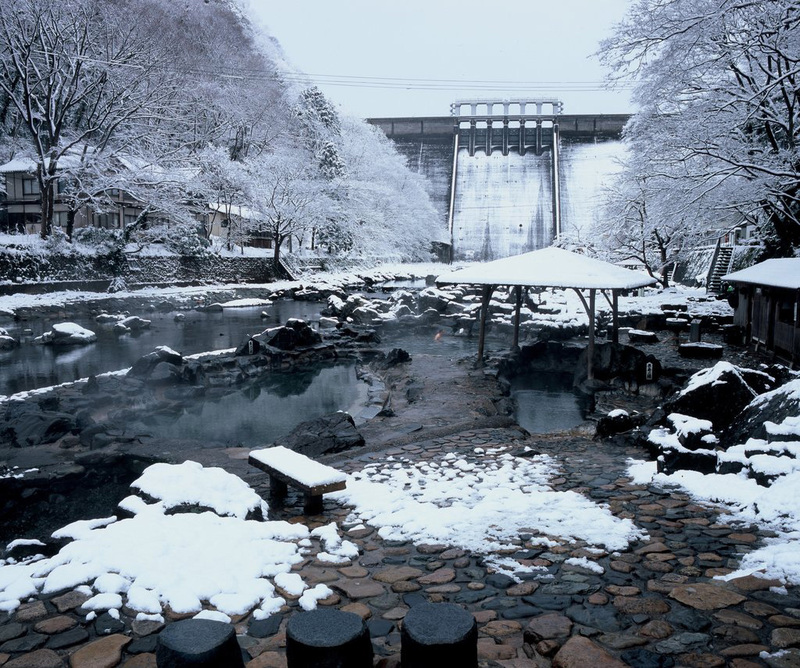 #Trivia: Did you know that Yubara onsen is an alkaline simple hot spring. It’s said to help problems like Autonomic instability, insomnia, depression. Not sure how true the effects are but the alkaline in the water definitely makes the skin feel very smooth. 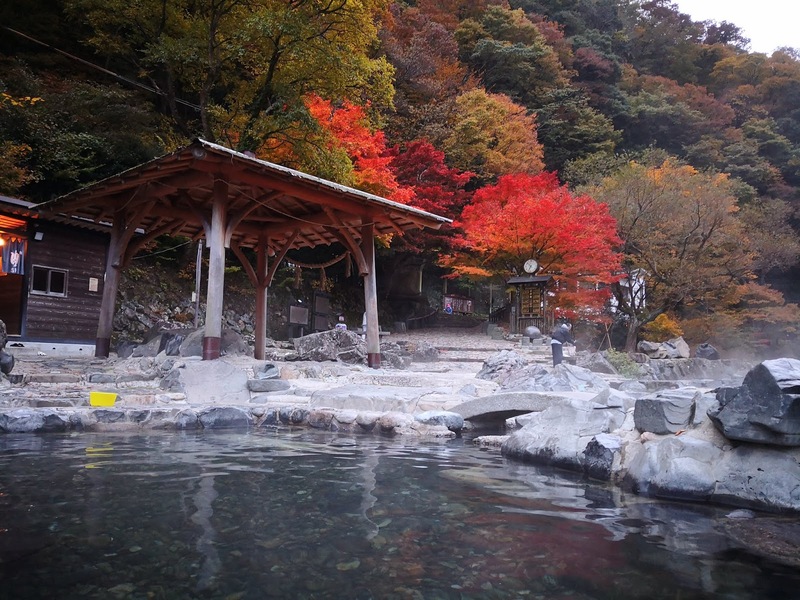 You can read up more info on types of hot springs here, super useful website! The Ryokan (traditional style hotel) we stayed at Yubara International Tourist Hotel Kikunoyu is the closest to Sunayu and customers can borrow Iroyukata (colourful Yukata) here as well to wear within or outside the hotel to take pictures. The ryokan staff was so helpful with dressing us up, I forgot how to tie an obi liao (lol). Always love tatami rooms, so comfortable! In this hotel they actually have a rooftop outdoor onsen called Kangetsunoyu, it was too cold for me to go at night so i skipped it, trust me i tried but never got passed the door leading to the pool area because of the cold winds haha. As much as i wanted to but.. nope. 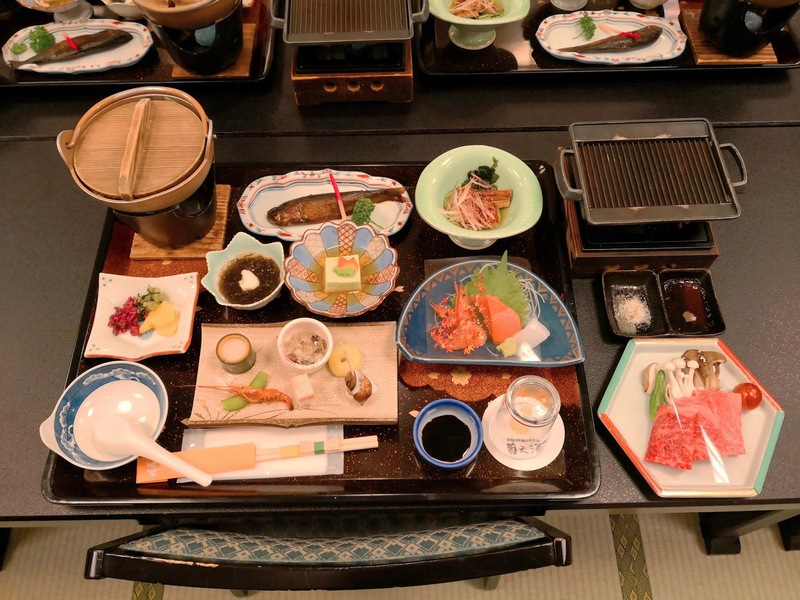 This is us in our colourful yukata having our delicious Kaiseki dinner. So full till we had to loosen our obi belt because our stomach was about to explode liao haha. 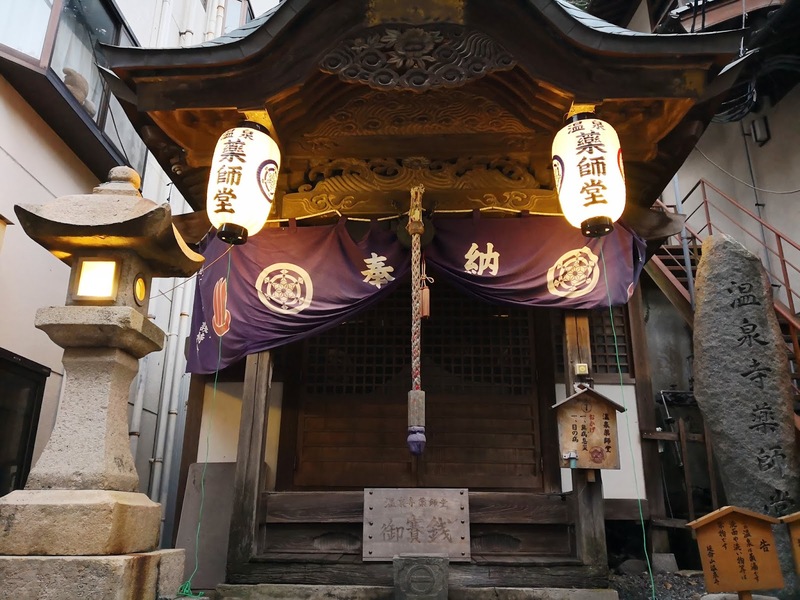 If you have some time to spare, do walk around the quaint town and soak (your eyes) in the view, pray at temples like Yakushi-do. 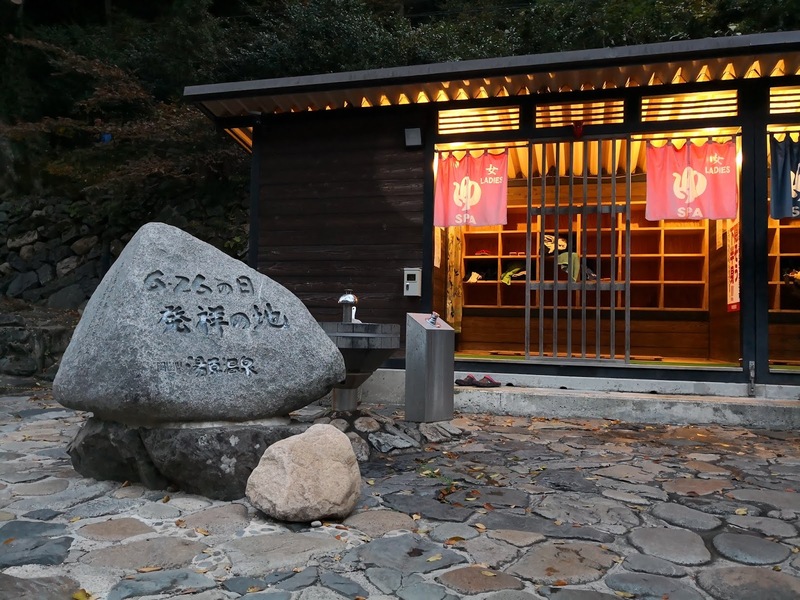 Yakushi means the Healing Buddha, and Yubara Onsen Yakushi-do is the temple for it. It’s popular among people to pray here for lost things in life, can be relationship or items, and it will return to you. 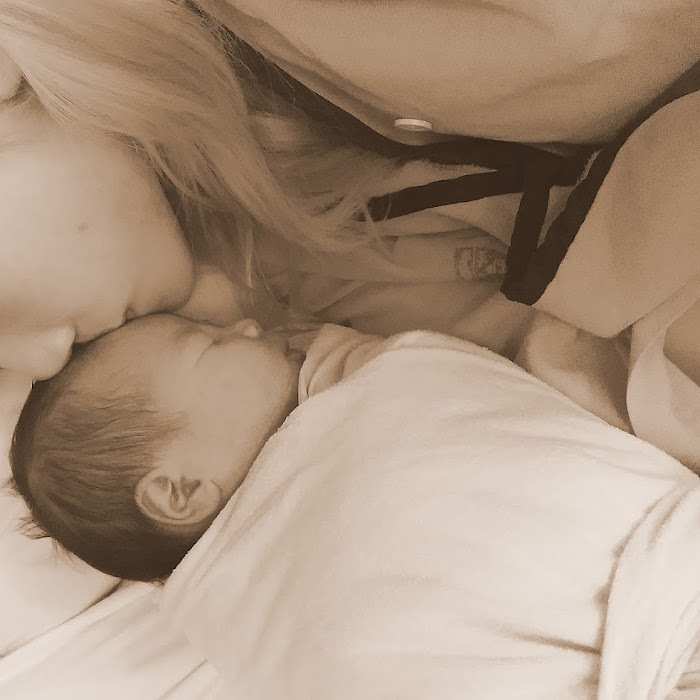 Not sure how true but it’s quite cool J The only lost thing I had in my life was my first daughter, I prayed that she’ll rest well wherever she is, that alone gave me peace. So if you have a nagging feeling of something being lost in your life, do come here to pray and who knows the God here will grant its return. 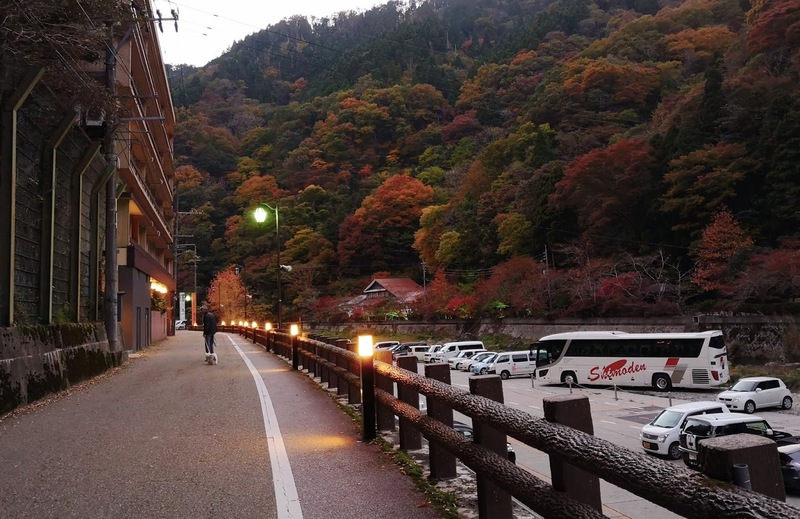 Wish I could visit Yubara Onsen every season, it’s so beautiful and peaceful here that I don’t mind retiring in areas like this. Everyday can go soak in onsen haha, who else here loves onsen as much as I do? 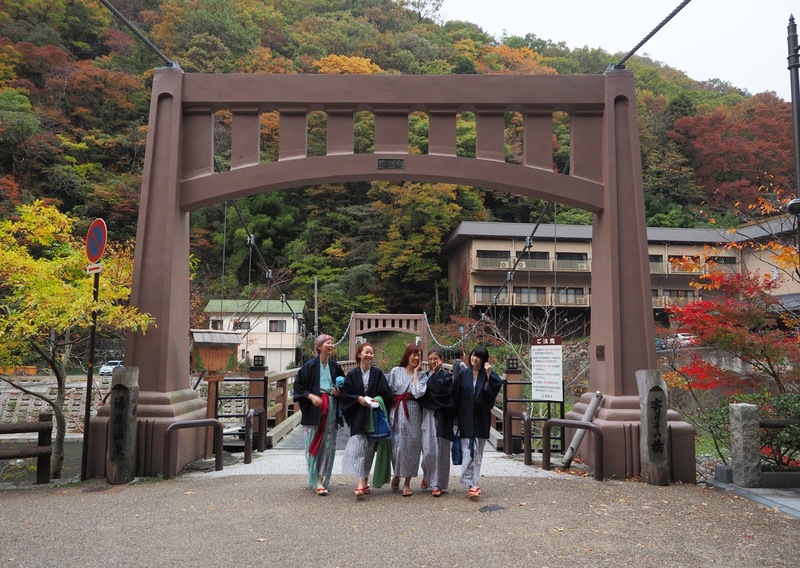 Make sure to put Yubara Onsen as one of your MUST VISIT ONSEN SPOTS IN JAPAN!